The .50 caliber machine guns of the battleship USS Pennsylvania unloaded 65,000 rounds of ammunition on December 7, 1941. On Sunday morning, December 7, 1941, Gunner’s Mate Russell Winsett, 19, awoke at 5 am as he did most mornings. As he went topside he could see that the weather was like almost every December day in Pearl Harbor, Hawaii, sunny blue skies with a few white puffy clouds. This was a day Winsett was looking forward to. He thought to himself, “It’s gonna be a beautiful day to visit the island with my cousin, his wife, and three kids.” Winsett had met his relative William Pope several months earlier when his family wrote and told him that he had a distant cousin also stationed at Pearl Harbor. Winsett had found the ship William was serving on, contacted him, and they met for a short visit. The next day his cousin went on a two-month cruise. Winsett was looking forward to reconnecting with his family member and getting to meet his wife and kids while taking in the sights of Hawaii. It was a long way from home for this Alabama farm boy. The lead ship of her class, Pennsylvania was laid down on October 27, 1913, by the Newport News Shipbuilding Company, in Newport News, Virginia. Launched on March 16, 1915, and commissioned on June 12, 1916, she began her proud tradition in October of that year as the flagship of the Atlantic Fleet. During her time as flagship, the Pennsylvania escorted ships carrying President Woodrow Wilson on tours as well as having Vice President Thomas Marshall and other dignitaries on board. In 1922, the Pennsylvania joined the Pacific Fleet based in San Pedro, California. During the interwar period, her duties primarily involved operations along the West Coast. 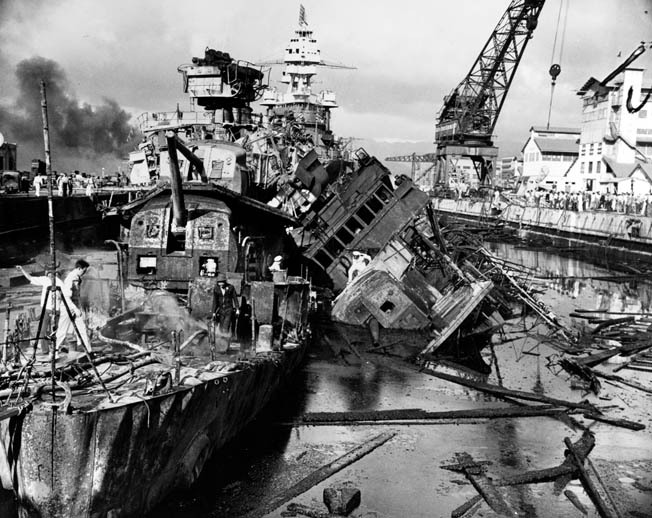 On the fateful morning of December 7, 1941, during the Japanese attack, the Pennsylvania was in Drydock No. 1 at the Pearl Harbor Navy Yard with three of her propeller shafts removed. In the same drydock off the bow of the Pennsylvania were two destroyers, the USS Downes and USS Cassin. Pennsylvania’s normal sea berth while in port was B-2, which was occupied that morning by the cruiser USS Helena with the minelayer USS Oglala alongside. Activity aboard the Pennsylvania was even quieter than normal since she was excused, due to being drydocked, from the normal morning antiaircraft drills. A condition watch of antiaircraft personnel was on duty, but the guns where unmanned. 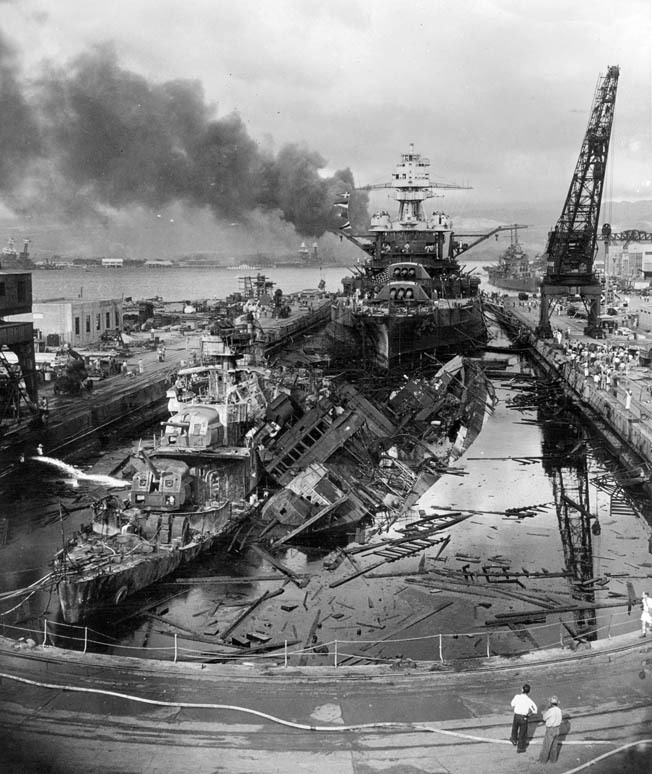 The battleship USS Pennsylvania lies in drydock in Pearl Harbor during the aftermath of the Japanese attack on December 7, 1941. Just forward of the battleship lie the severely damaged destroyers USS Downes (left) and Cassin. Pennsylvania sustained some damage, but her crew managed to fight back, firing machine guns and antiaircraft weapons at the attackers. Then, just as Winsett began walking back toward the Pennsylvania, he heard booming noises. “I thought, ‘Man, that’s a strange time to have battle practice on Sunday morning.’” Explosions were heard on the end of Ford Island aft of Drydock No. 1. At 7:57 am came a bugle call and alarm for general quarters. Wearing his dungarees, Winsett ran the 50 yards back to the ship and his battle station, a .50-caliber machine gun facing toward the bow on the starboard side. He still believed it was just “another drill.” As soon as the stations were manned, Condition “YOKE” (Enemy Is Probable) was set by Captain C.M. Cooke, Jr.
“That Ensign took me before the captain after everything was over and the Captain just shook his head and said, no we are not going to even consider this. That ended my court martial,” Winsett laughed. 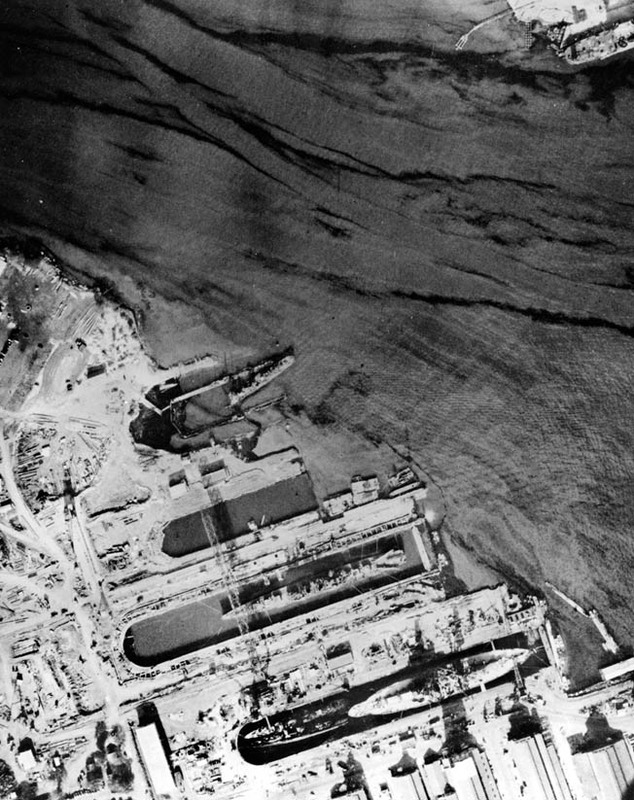 In this aerial photograph of Pearl Harbor taken approximately December 10, 1941, the USS Pennsylvania is prominently visible at right in drydock with the heavily damaged destroyers Cassin and Downes visible forward of the large warship. Fighters and dive bombers streaked overhead, strafing the Pennsylvania as they passed. Winsett kept firing. One civilian, a shipyard worker named George Walters, ran the large dock crane back and forth along its track attempting to block the path of the low-flying Japanese aircraft with the boom. Gunners on the Pennsylvania had their fields of vision blocked since they were below ground level in the drydock and used the boom as a warning sign to indicate the direction of incoming Japanese aircraft. Acting automatically, the young sailor fed bullets into the machine guns on a long belt and corrected his aim with red-colored tracers. After about 15 minutes of firing, the gravity of the situation began to sink in. “I realized at that point that we were at war,” Winsett observed. Shooting from the mainmast was a strange experience, one moment spent feverishly firing at Japanese planes and the next forced to sit and observe since the weapon would not swing around 360 degrees. In those moments, Winsett was free to look around and witness the battle. Winsett also remembers the explosion from a bomb that exploded between the two destroyers in drydock. “I heard later on that the bomb didn’t create a lot of damage, but it set off a torpedo on one of the destroyers that really caused most of the damage,” he noted. Fires raged on both the Downes and the Cassin, and the intense heat began to blister the paint on the Pennsylvania and set the teak wood decks ablaze. Pennsylvania was the first ship to return fire that morning, its machine guns barking at 8:02. During the attack Winsett and his fellow gunner’s mates fired 65,000 rounds of .50-caliber ammunition. Hours of drilling paid off. Winsett stayed at his gun and kept fighting back “for what seemed like 8 to 10 hours, but after it was over the battle was not even two hours long.” He is thankful that his gun position was well protected with a four-foot wall with deflection shields to protect the sailors manning the gun from enemy fire. “It was tough moving around as the shell casings fell to the floor of our little area and began to pile up as deep as our ankles,” he said. Early in the action, three Japanese planes came in low from the port beam, firing their machine guns at the Pennsylvania, but Captain Cooke reported, “Strafing attack not effective.” During the torpedo attacks, one enemy plane was seen to burst into flames about 2,000 yards on the starboard bow. 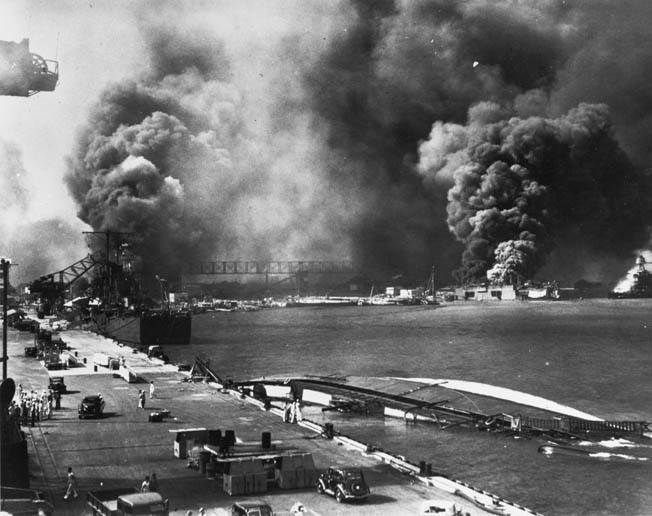 This panoramic view of Pearl Harbor during the Japanese attack reveals the destruction wrought on that Sunday morning. The view is from Pier 1010 and depicts the battleship USS Nevada on fire at right, the cruiser USS Helena moored beside the pier at left, and the hull of the capsized minelayer USS Oglala in the foreground. Smoke billows in the distance at left as the destroyers USS Cassin and USS Downes burn furiously in Drydock No. 1 forward of the USS Pennsylvania. Sometime between 8 and 8:30 am, the battleship USS Nevada was getting underway and reached a point on the Pennsylvania’s starboard quarter about 600 yards distant when a dive bombing attack approached the Pennsylvania off the port bow. It appeared that 10 to 15 Japanese planes were coming in succession at low altitude. This attack apparently was directed at the Pennsylvania and the two destroyers in drydock, and the attackers were taken under heavy fire. Just before reaching the Pennsylvania, about two-thirds appeared to swerve to the left, a number of them dropping bombs near the Nevada with some misses ahead and astern and at least one hit near the bridge. The Nevada stopped temporarily. At the same time, other planes passed to port and over the Pennsylvania, dropping bombs that fell in the water beyond the caisson. Except for machine-gun bullets, the Pennsylvania was not hit during this attack wave. One of the dive bombers dropped a bomb on the destroyer USS Shaw in the floating drydock off Pennsylvania’s starboard side, setting it on fire. The Nevada then slowly swung around and headed to port, later beaching at Hospital Point. Between 8:30 and 9:15 at least five Japanese bomber formations passed over the Pennsylvania, one from the port bow, one from ahead, one passing to starboard, and two from astern. These attackers were generally in “V” formations with four to six planes in each. The Japanese planes maintained straight courses and were estimated at an altitude of 10,000 to 12,000 feet. The sailors aboard the Pennsylvania believed their first attack was against Battleship Row across the channel. 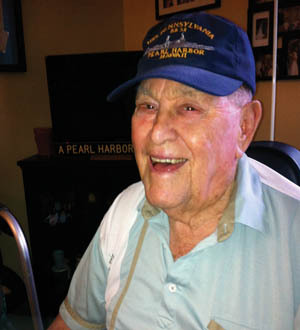 Years after the Pearl Harbor attack, former Gunner’s Mate Russell Winsett recalled vividly the events of the fateful morning when the United States was plunged into World War II. The second attack came in on the port bow and dropped bombs on the ships in the drydock. One bomb hit Downes at approximately 9:06. Another one hit the starboard of the Pennsylvania, and a third hit the boat deck of the battleship a few feet abaft 5-inch gun no. 7, passing through the boat deck and detonating in the casemate of 5-inch gun no. 9. “We had a lot of Marines manning that gun that were killed during that time,” Winsett said. Yet another bomb is believed to have fallen harmlessly into the harbor outside the dock. Sporadic attacks on the Pennsylvania continued for some 15 minutes. The last enemy run was from a plane passing to the south at a low altitude along the port beam. About 30 machine-gun hits in the shield around the maintop machine gun where Winsett was positioned may have come from this plane. None of the bullets that struck the shield managed to penetrate it. This particular plane was taken under heavy fire by Pennsylvania’s port batteries and was hit by the machine gun on the port side of the stack. It crashed on the nearby hospital grounds. At 9:20 drydock flooding was started to assist in putting out fires. Both Downes and Cassin were on fire from stem to stern. Flaming oil on the water in dock set fire to the paint on the Pennsylvania’s starboard bow below Winsett’s position. The bomb hit on the dock had cut electrical power, and the Pennsylvania switched to reserve battery power. About 9:30, the destroyers were rocked by explosions, and at 9:41 torpedo warheads on Downes exploded on the starboard side of the destroyer, covering the area with debris. A section of torpedo tube, weighing between 500 and 1,000 pounds, struck the Pennsylvania’s forecastle. Precautionary measures were taken on the bow of the Pennsylvania to prevent the spread of the fire internally. Luckily, the flames were brought under control before serious damage to the battleship resulted. The Cassin, from which part of the hull had been removed for dock work, rolled over on the Downes. 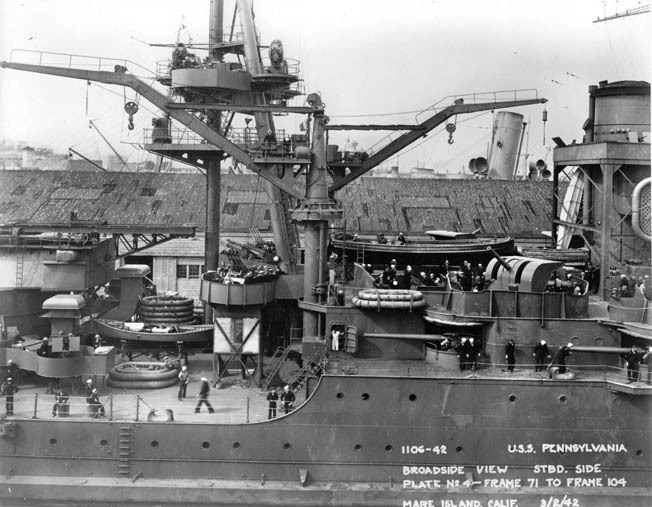 The damage to the Pennsylvania was relatively light considering the number of attacks she endured. The 500-pound bomb hit that damaged the 5-inch guns blew a hole roughly 20 feet by 20 feet in the boat deck. The explosion wrecked galley equipment and caused fuel oil from the service tanks to run into the decks below. Bomb fragments on the boat deck struck a 40-foot motor sailing launch in its skids, perforating the side in a number of places. This motor launch probably saved some of the personnel manning the portside guns. Fires erupted on the main deck and on the second deck, and these were difficult to put out because of the lack pressure in the water mains. Fire, water, and leaking oil caused damage to officers’ rooms on the second deck. In this view of Drydock No. 1 following the attack, the destroyer Cassin has rolled over against the superstructure of the destroyer Downes. Japanese bomb hits and the resulting fires seriously damaged both ships. Looming behind the stricken destroyers, the USS Pennsylvania emerged from the attack with slight damage, the walls of the drydock having provided some protection. The bomb explosion in casemate No. 9 killed 26 men and two officers. One officer, Lt. Cmdr. J.E. Craig, was probably passing through the compartment to carry out assigned duties aft. Lieutenant (j.g.) Richard R. Rall of the medical detachment was killed at the battle dressing station in the warrant officer’s mess. One man, tending the donkey boiler on the dock that supplied steam to the ship, was killed, probably either by a machine-gun bullet or by the bomb hit on the dock on the starboard side of the ship. Both Winsett and the USS Pennsylvania went on to serve throughout World War II. Winsett completed a 20-year career with the Navy and retired as a chief petty officer. After Pearl Harbor he was transferred to a new ship, the destroyer USS Foote. Winsett’s World War II service included seven campaigns. He witnessed the raising of the U.S. flag on the summit of Mount Suribachi on Iwo Jima as well as the invasion of Okinawa. After the propeller screws were replaced on the Pennsylvania, she sailed back to Bremerton, Washington, for immediate repairs and was overhauled in San Francisco in 1942. She participated in the Aleutian Campaign in 1943, where she engaged in the shore bombardment at Holtz Bay, Attu, and Chicago Harbor. As she retired from Attu, she maneuvered at full speed to avoid a torpedo attack from the Japanese submarine I-31, which was subsequently sunk by the destroyers USS Edwards and Frazier. In January 1944, the Pennsylvania bombarded Kwajalein atoll in support of the Marine landings there. The following month Pennsylvania steamed boldly into the lagoon at Eniwetok with her batteries blazing away at enemy installations. Later that morning she bombarded Engebi in support of the assault waves hitting the beach. After Engebi was secured, she steamed to the vicinity of Parry Island, where she took part in the bombardment in support of those landings. At Guam, she fired more ammunition than any other warship in U.S. naval history during a single campaign. Pennsylvania earned the nickname “Old Falling Apart” because she expelled so much steel that she appeared to be actually falling apart. The USS Pennsylvania sailed to Mare Island, California, where this photo was taken, and eventually reached Bremerton, Washington, to undergo repairs to damage sustained at Pearl Harbor and upgrades to some equipment. “Old Falling Apart” ended her service in July 1946 as a target ship during atomic bomb tests at Bikini Atoll. Chief Petty Officer Winsett retired from the Navy in 1960 and began work at the U.S. Post Office from 1960 and retired as postmaster in Rio Grande, N.J. in 1975 He passed away in February, 2015 at the age of 94.
resident of Fort Myers, Florida. Tags atomic bomb, Attu, battleship, Boxing, CIA, Destroyers, EAM, Florence, general, Guam, Hawaii, Interviews, Iwo Jima, Japan, Japanese, machine gun, Marines, naval history, navy, Norfolk, Odin, Okinawa, OSS, Pacific, Pacific Fleet, Pearl Harbor, pearl harbor attack, pearl harbor navy, POW, submarine, Tanks, Tern, The Pacific, the pearl harbor, the pearl harbor attack, torpedo, Tory, Troy, United States, USS Cassin, USS Helena, USS Nevada, USS Oglala, USS Pennsylvania, USS Shaw, waves, weapons, WIN, Woodrow Wilson, World War I.